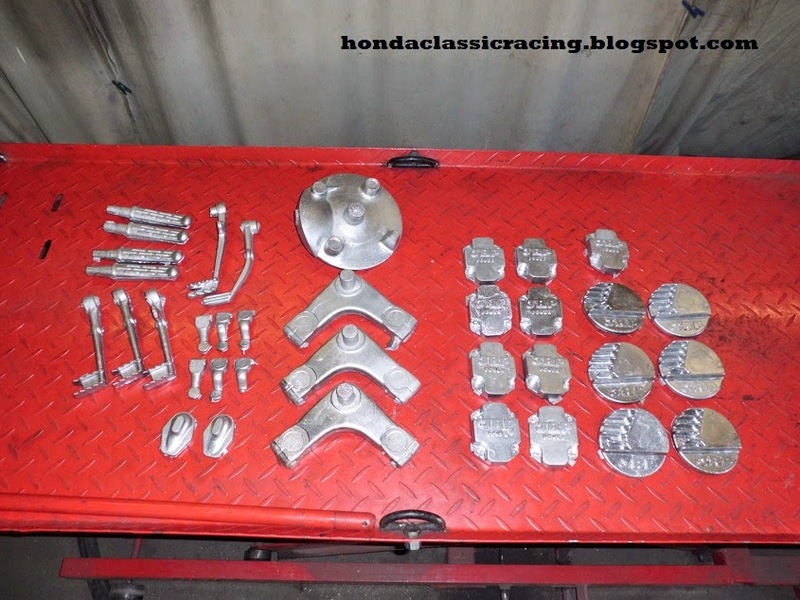 some Honda MT125R top yokes, CR750 pedals and shift arms, CR110 pedals and pegs, also useful for other Honda racers like RC162, RC181, CR450, CR72 replicas and so on. Another 160mm TLS front brake plate and a bunch of JRP engine covers for monkey engines, most of which are already reserved for friends. Are you doing anymore casting? I've got an idea that I CB750 folks would love - am sticking SOHC era alloy switch-pots onto my '82 CB900K0 Bol Bomber (that's what you call an '82 CB900F Bol D'Or based homage to the '65 CB450K0 Black Bomber - duh.) So yeah, lots of folks putting lower bars on their SOHC era bikes these days. Well - have you ever seen the CB900F2 "Sport-Kit" throttle pots? 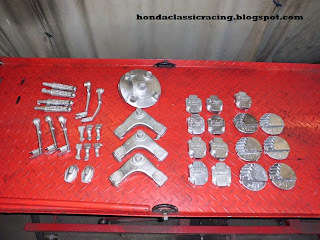 Am also interested in some CB72/CB77 Hawk/SuperHawk style rear-sets brackets for these DOHC Honda models. Was thinking they'd actually be pretty cool for all sorts of CBR/VFR models, etc. Just to be clear, the difference between sport-kit and regular throttle pots is the orientation of the cables - forward & up rather than down. Was thinking if it's done right, all that one needs is a modified top half of the clam-shell housing. This way, no need for all of the dents folks are pounding into their gas tank. Yeah, one COULD use an aftermarket push-pull throttle, and point the cables anywhere you like. But then you're giving up space on the bar which moves the throttle-grip and the brake lever to a different orientation - AND it gives a non-OEM "custom" (aka frigged up if you're coming from where I'm at) aesthetic to the whole cockpit area - Even if you cut off the empty throttle housing portion from that side of the switch-pot, you're still giving up a good half inch or more 'cause of the clamp area which holds the top and bottom halves of the aftermarket housing. I've tried opening up the switch-pots to over-lap that clamp area, but it doesn't work well - the best I've found was to leave the top half of the throttle slide housing, to over-lap the clamp with that. On Honda switches, this keeps the "OFF ON OFF" lettering, keeping some of that OEM original vibe, which SOHC lovers dig so much. One solution I've been looking at is to weld or solder-braze (with better rod such as "Aerobraze" etc) a couple of BLOBS, just over the throttle slide housing. These could then be drilled and tapped. Then the open holes at the bottom can simply be plugged - and plugs already exist, from models which use the two cable push-pull housings but which only have a single cable carburetor set-up with return spring etc. One could use these plugs if available, or simply cram some epoxy in there 'cause let's face it you're not gonna put it back the other way. Whatever - this is all a whole lot of hassle, whereas if it were possible to CAST new parts? Tough to say. Only if the castings could be accurate enough, that machining time for said castings is kept to a minimum. High quality gravity-die or vacuum-die castings at the most basic. Possibly even more of a hassle. Then again, who's to say? Perhaps welding up two blobs or one huge thick massive blob, and machining the threaded holes for cables, on an EXCHANGE basis? Do up a couple of 'em, have customers send in donor parts - insisting of course that people disassemble and reassemble the whole thing themselves. Maybe it would work? Slow going, getting 'em done one at a time like that. However I see this as a possibly VERY popular mod for any & all vintage models with alloy switch pots. For plastic housings, well - the DOHC era Honda switches have ABS plastic. So, for the current price of the "Sport-Kit" aka "Euro" switches, I'm also modifying some of the regular non-sport-kit North-American market version switches, sacrificing out out of each pair, to cut the throttle slide housings off and destroying that half, then cutting one off whole and destroying the rest of the switch - THEN the two can be glued together in whatever orientation one likes.